, an ingenious and learned English divine, was the son of a taylor in Oxford, and born in the parish of All Saints there about 1593. He was entered early of Christ-church in the time of Dr. Ravis, his relation and patron, by whom he was chosen student; and in 1615 he took orders. He was before noticed for his skill in poetry and oratory, and now distinguished himself so much by his eloquence and popularity as a preacher, that he had two benefices conferred on him in the diocese of Oxford. In 1618 he went as chaplain to sir Francis Stewart, when he accompanied the count Gundamore to Spain, in which journey Holyday exhibited such agreeable conversationtalents, that the count was greatly pleased with him. Afterwards he became chaplain to the king, aud was promoted to the archdeaconry of Oxford before 1626. In 1642 he was made a doctor of divinity by mandamus at Oxford; near which place he sheltered himself during the time of the rebellion. When the royal party declined, he so far sided with the prevailing powers, as to undergo the examination of the triers, in order to be inducted into the rectory of Chilton in Berkshire; for he had lost his livings, and the profits of his archdeaconry, and could not well bear poverty and distress. This drew upon him much censure from his own party; some of whom, however, says Wood, commended him, since he had thus made provision for a second wife he had lately married. 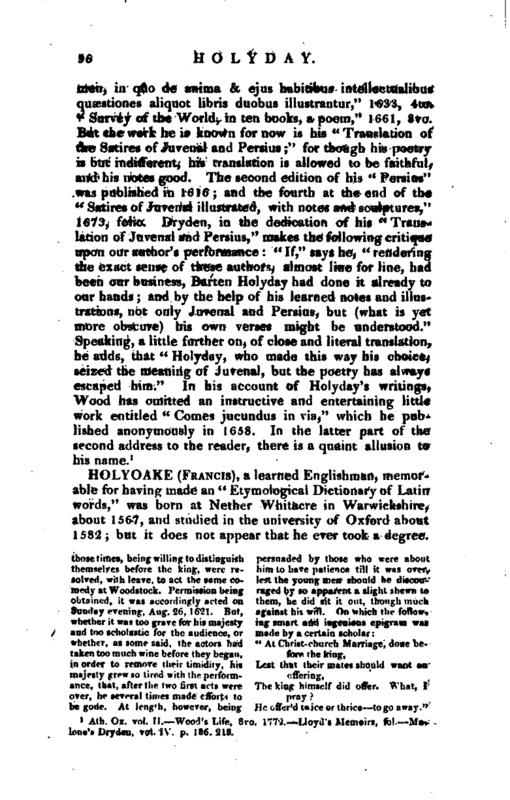 After the Restoration he quitted this living, and returned to Iffley near Oxford, to live on his archdeaconry; and had he not acted a temporizing part, it was said he might have been raised to much higher promotion. His poetry, however, got him a name in those days, and he stood fair for preferment. His philosophy also, discovered in his book “De Anima,” and his well-languaged sermons, says Wood, speak him eminent in his generation, and shew him to have traced the rough parts of learning, as well as the pleasant paths of poetry. 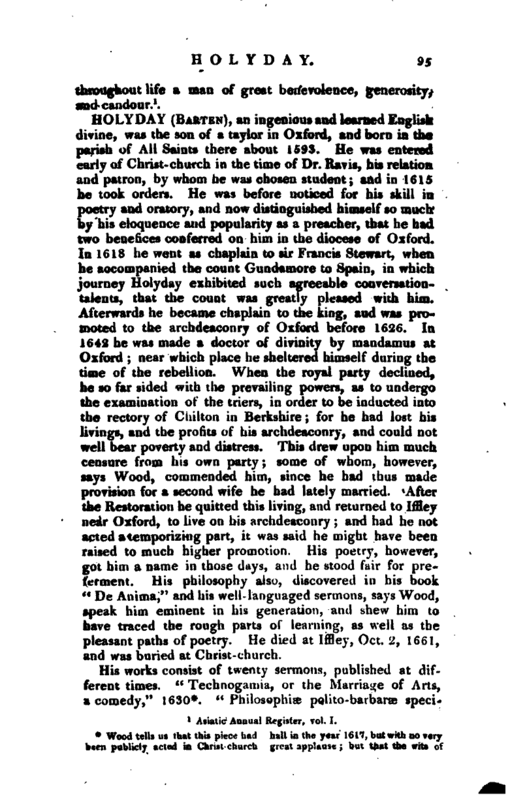 He died at Iffley, Oct. 2, 1661, and was buried at Christ-church. Ath. Ox. vol. II. Wood’s Life, 8vo. 1772. Lloyds memoirs, fol. Malone’s Dryden, vol. IV. p. 186. 218.